We are now offering Sweet Baby Broccoli in addition to our full line of premium “Queen Victoria” vegetables. Great for grilling, stir fries or quickly blanched as a crudité, this item is a consumer favorite. Call today for details! Remove tough, fibrous stems from broccoli crown and use a paring knife to cut florets in desired size for recipe. Broccoli can be eaten raw with a vegetable dip or in salads or cooked in a number of methods including blanching, steaming, sautéing, and roasting. Broccoli is commonly included in stir-fry dishes, soups, casseroles and raw vegetable platters. 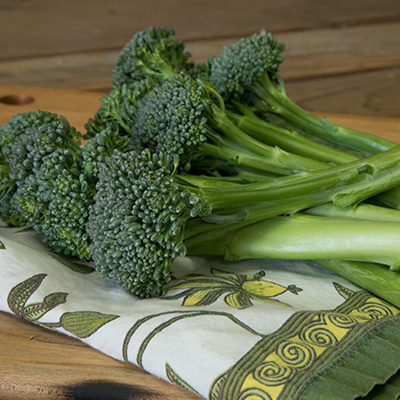 Avoid any broccoli with dried out or browning stems and yellowing florets. Good quality broccoli will have light green stalks and compact, dark green florets. Store broccoli in the vegetable drawer or crisper section of the refrigerator. Always wash fresh produce before consuming. © 2019 Ippolito International. All Rights Reserved.